Accountability Counsel collaborated with the Papua New Guinea-based Centre for Environmental Law and Community Rights (CELCOR) to assist indigenous smallholders in Oro Province, Papua New Guinea in their efforts to gain a voice in the design of a World Bank-funded palm oil production project called the Smallholder Agriculture Development Project (SADP). The smallholders feared that the project would harm their environment and extract burdensome levies from palm oil growers without resulting in real benefits for local communities. Through detailed research, collaboration, and sustained advocacy, we were successful in exposing the problems and causing the bank to re-design the project in consultation with affected communities. In November 2009, Accountability Counsel and CELCOR filed a complaint with the World Bank Inspection Panel on behalf of anonymous smallholders in Oro Province. The complaint asserted that SADP violated World Bank policy in a number of ways, including the failure to consult with locally affected indigenous people or gain their consent before moving forward with the project, as well as the likelihood that the project as planned would not reduce poverty in local communities. 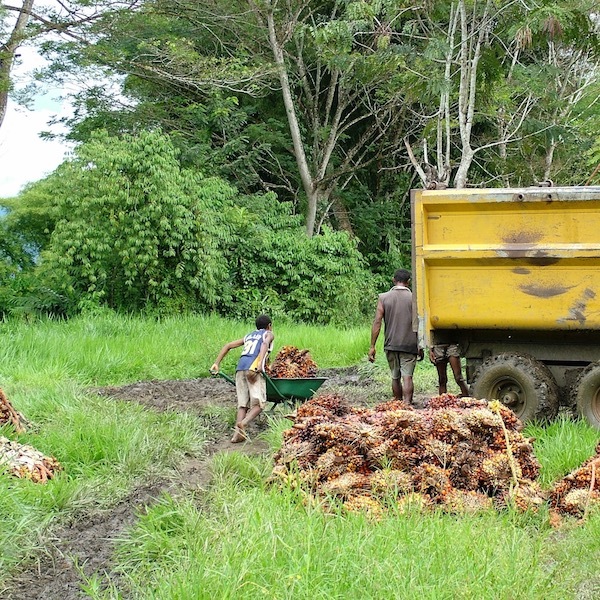 Of particular concern to the claimants was that the unsustainable payment plan devised for the project’s planned road maintenance would enact burdensome and unsustainable levies on small oil palm growers, and that by promoting palm oil production without providing any alternatives for income generation, the project would lead to a degradation of critical forests and grasslands on which local people depend. The World Bank Inspection Panel conducted a full investigation into the project in response to the communities’ complaint and released its Investigation Report in December 2011. 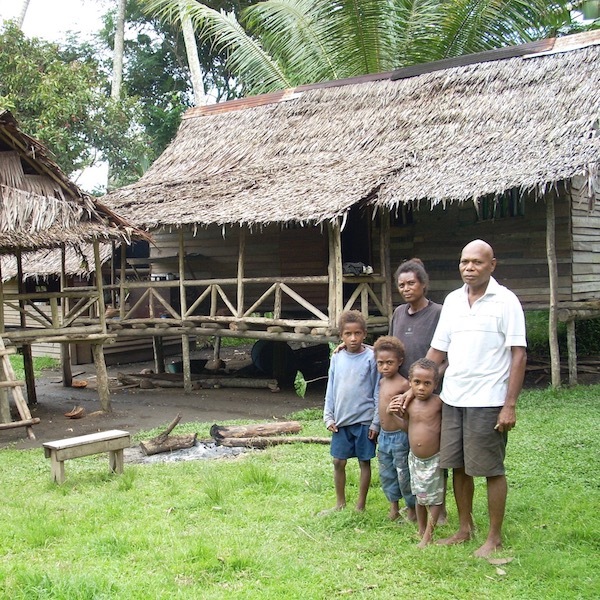 Validating the smallholders’ complaint, the report documented numerous violations of World Bank policies, most significantly that the project failed to incorporate basic elements required to decrease poverty among project “beneficiaries” and was designed without consultation or study of indigenous landowners’ capacity to pay their proposed share of the road maintenance portion of the project. In a victory for our clients in Papua New Guinea, the World Bank’s board of directors approved an action plan in response to these findings, with specific steps for bank management to carry out to bring the project into compliance. Accountability Counsel assisted affected communities by working with CELCOR to monitor the bank’s implementation of the action plan, confirming that the bank took steps to address problems in all key areas. The World Bank has been funding palm oil projects in Papua New Guinea since 1969. The Oro Smallholder Oil Palm Development Project (OSOPDP), implemented from 1992 to 2001, sponsored new oil palm plantings and the construction and maintenance of access roads in Oro province. Despite the World Bank’s promises that these projects would alleviate poverty, OSOPDP and other past oil palm projects have contributed to food insecurity, land conflict, deforestation, and deteriorating community health in Oro province. Many smallholders and community members in Oro province were unsatisfied when the OSOPDP failed to deliver its promised results. Communities found that the money they earned growing oil palm did not translate to higher living standards. The OSOPDP incentivized “mono-cropping,” leaving smallholders dependent on fluctuating oil palm prices and leading to deforestation and the destruction of food gardens. Moreover, many of the planned roads were not built or maintained as promised, leaving growers with no way to transport their fresh fruit bunches, which must be processed within a short time period after collection. 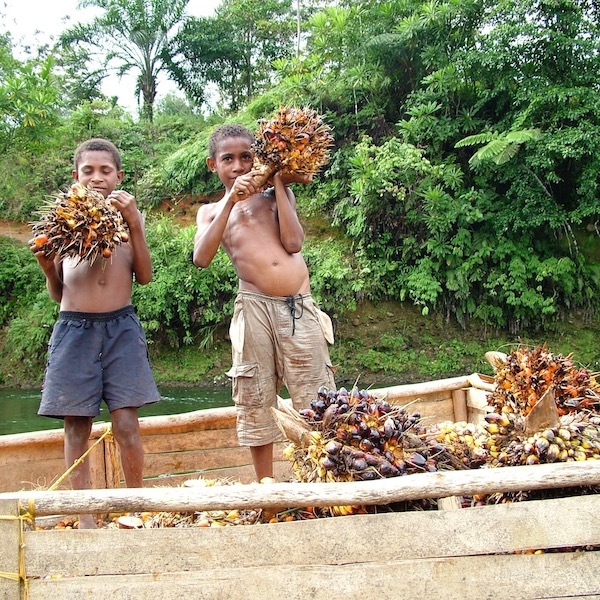 Despite these problems, the bank continues to fund oil palm projects in PNG. The $69 million Smallholder Agriculture Development Project (SADP) called for $27.5 million in funding from the World Bank. The Project will received $10.2 million from the Papua New Guinea Sustainable Development Program, $10.7 from provincial governments in Papua New Guinea, and $7.3 million from the project’s stated beneficiaries, the smallholder oil palm growers, in the form of road maintenance levies. The palm oil milling companies, which profit from the increased oil palm production under the Project, contributed $5.7 million to the Project, less than the Project’s stated beneficiaries. Funding goes to the Oil Palm Industry Corporation, which is in charge of implementing SADP. The project’s stated goal is to alleviate poverty in Papua New Guinea by expanding oil palm production and improving rural access roads. The project involves “infilling” or planting new blocks of oil palm between established blocks and along existing access roads, as well as reconstructing damaged roads and establishing a system for future road upkeep. The project will be implemented in three communities in Papua New Guinea: Popondetta in Oro Province, and Hoskins and Bialla in West New Britain Province. Communities in Oro Province feared that SADP would perpetuate the same social and environmental harm as past World Bank oil palm projects. Like past oil palm projects in Papua New Guinea, SADP was based on the Nucleus Estate Scheme concept whereby smallholder growing areas are developed adjacent to oil palm estates. The project design is based on the pre-existing relationship between the smallholder growers, OPIC, and the private-sector palm oil milling companies, keeping the smallholders dependent on the private milling companies for credit, agricultural inputs, and fruit collection services. The project incentivized creation of 9,000 hectares of new oil palm plots. 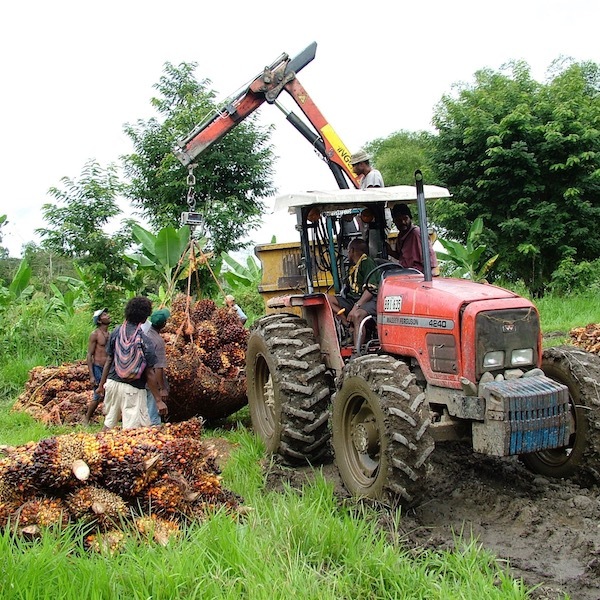 It aimed to encourage smallholders in Papua New Guinea to grow oil palm as their main income-generating activity. A levy would then be deducted from growers’ income to rehabilitate and maintain rural access roads. The government and the milling companies are also meant to contribute to the Road Maintenance Trust Fund, but the project did not include a mechanism to ensure their participation. Many smallholders were concerned that the project as designed would not reduce poverty or improve livelihoods, and instead will limit their economic opportunities by presenting oil palm agriculture as the only income-producing option in the region, despite the fact that it has been unsuccessful in increasing their standard of living. They feared that the project would cause environmental harm including degradation of critical forests and increased water pollution from mill effluent being discharged into local rivers. The smallholders were also concerned that the road maintenance plan would impose unfair and likely unsustainable fees on smallholders and are frustrated that this fee structure was developed without consultation. Prior to Accountability Counsel’s involvement in the case, a community-based organization in Oro Province contacted the World Bank with concerns about the project. U.S.-based organization International Accountability Project (IAP), which was involved in the early stages of the case, then sent a representative to Papua New Guinea in April 2009 to gather information about the project and its impact on smallholders. IAP, along with PNG-based Centre for Environmental Law and Community Rights (CELCOR), visited the Project-affected areas and met with community organizations and smallholders to hear about their experiences with oil palm and SADP. None of the communities had been consulted about SADP’s design and most expressed a desire for support for alternative agricultural options other than planting oil palm. The communities worked with CELCOR and IAP to develop a campaign strategy that included filing a complaint with the World Bank Inspection Panel. They sought Accountability Counsel’s assistance with drafting the initial complaint, working closely with CELCOR and IAP. In November 2009, Accountability Counsel and CELCOR supported indigenous small landowners, or “smallholders” in filing a complaint with the World Bank Inspection Panel, the accountability mechanism responsible for ensuring the Bank’s compliance with its own policies. The complaint detailed violations of bank policy in connection with the Smallholder Agriculture Development Project (SADP) and prompted the Inspection Panel to conduct a full investigation into the project. The panel’s Investigation Report, released in December 2011, documented numerous violations and led to the creation of an action plan, approved by the World Bank’s board of directors, meant to bring the project into compliance with bank policies. Read more about the complaint process and Accountability Counsel’s impact. A Papua New Guinea-based organization dedicated to promoting and defending environmental and customary rights in PNG through law and advocacy to ensure sustainable resource management for the benefit of the present and future generations. A U.S.-based organization that challenges destructive development projects that uproot and impoverish millions of people across the Global South. A nonprofit that campaigns for the forests, their inhabitants, and the natural systems that sustain life by transforming the global marketplace through education, grassroots organizing, and non-violent direct action. Bank Management submitted its First Progress Report on the implementation of the Management Action Plan (MAP). The report detailed bank actions in three key areas (a) information disclosure, consultation and broad community support; (b) environment; and (c) institutional sustainability. World Bank management traveled to Oro Province to meet with claimants and other interested smallholders as part of its effort to bring SADP into compliance with bank policy. The bank presented its Action Plan and gave updates about the project’s status. Claimants and other smallholders then expressed their continuing concerns, which centered around the Road Maintenance Trust Fund and development of alternative livelihoods. Accountability Counsel met with the World Bank Executive Director in charge of Papua New Guinea to request assistance in determining whether management was on track to complete its early 2012 commitments within the target timeframe. Accountability Counsel and CELCOR sent a letter to World Bank management requesting a timeline for carrying out the action plan and addressing the project’s known policy violations. Bank management responded with expected timelines for completing some of the required actions and indicated that it would report back to the board in 12 months to update them on the implementation of the action plan items. The panel’s investigation report and management’s response were released to the public. The Investigation Report confirmed violations of the bank’s policies regarding Indigenous Peoples (OP/BP 4.10), Environmental Assessment (OP 4.01), Forests (OP/BP 4.04), Project Appraisal (OMS 2.20), and Economic Evaluation of Investment Operations (OP 10.04). Most significantly, the panel found that the project fails to incorporate basic elements required to decrease poverty among project “beneficiaries” and was designed without consultation or study of indigenous landowners’ capacity to pay their proposed share of the road maintenance portion of the project. Taken together, the action plan and annexes in management’s response addressed many, but not all, of the violations found by the Inspection Panel. Management’s commitments, approved by the board, included developing and implementing a consultation framework; improving documentation of consultations with affected communities; improving mill effluent processing and environmental monitoring; and ensuring that any levies imposed on smallholders to fund road works do not present an unsustainable burden. Accountability Counsel’s summary of the actions the World Bank should take to bring the project into compliance is available here. The World Bank board of directors met to discuss the Inspection Panel’s report and management’s response. The board approved management’s action plan and the commitments set forth in Annex 1, requiring management to carry out a number of actions to bring the project into compliance with bank policy. Accountability Counsel distributed The World Bank’s Duty in PNG and An Environmental and Due Diligence Failure to all World Bank executive directors to ensure that the directors were informed about claimants’ concerns prior to the board vote. Accountability Counsel met with the World Bank executive director in charge of Papua New Guinea about claimants’ ongoing concerns and the problems with the effluent study. Accountability Counsel and CELCOR released a report, The World Bank’s Duty in PNG, which highlights the ongoing concerns of smallholders in Project-affected areas and the responses still required by the World Bank to bring the Project into compliance with its own policies. Accountability Counsel and CELCOR also released a critique of the effluent study, An Environmental and Due Diligence Failure, as an Annex to The World Bank’s Duty in PNG. World Bank management issued a response to the Inspection Panel’s report, which included an action plan and annex listing actions management committed to undertaking in order to bring the project into compliance with bank policies. In violation of bank policy and practice, bank management unilaterally developed the action plan without any consultation with the claimants, their representatives, or the affected communities generally. Per the panel’s policy, the response was not released to the public at this time, nor was a copy released to the claimants or their representatives. The Inspection Panel submitted its investigation report to the World Bank board of directors and management, giving management six weeks to respond. Per Panel rules, the report was not released to the public at this time, nor was a copy released to the claimants or their representatives. Bank Vice President James Adams sent a response letter promising the release of the effluent study by the end of July and assuring Accountability Counsel and CELCOR that infilling had not, in fact, begun under SADP. Following its Oil Palm Strategy Review, the World Bank announced the adoption of a new World Bank Group Framework and IFC Strategy for Engagement in the Palm Oil Sector. Accountability Counsel and CELCOR sent another letter to the World Bank President asking for an updated commitment for completing actions required to bring the SADP into compliance with World Bank policy. The dates that bank management had previously given for completing actions necessary to bring the project into compliance all passed with little progress being made. Project documents still had not been made available to affected people in their own language, promised consultations with affected people had not taken place, and the effluent study, which was initially required before project approval, still had not been completed. Accountability Counsel and CELCOR continued to request, on behalf of the affected communities, that funding for the SADP be suspended until the project was brought into compliance with admitted bank policy violations. The Inspection Panel traveled to Papua New Guinea to conduct a 2-week investigation into the violations alleged in the complaint. Accountability Counsel sent a delegation to Papua New Guinea during the panel’s visit to work alongside CELCOR to provide support to the communities during the investigation. The panel held meetings with smallholders who would be affected by the project and with representatives from OPIC and the mill companies. By the end of its trip, the Inspection Panel had witnessed social harms, including alcoholism, overcrowding, sexual abuse, domestic violence, and lack of budgeting or financial skills, caused by previous oil palm projects in the region. The panel identified numerous issues and inadequacies with the design of SADP, as well as a failure to carry out several actions required for project approval. Accountability Counsel and the Center for International Environmental Law (CIEL) submitted comments to the World Bank Group Palm Oil Strategy Review. The World Bank initiated the review to analyze the bank’s involvement in the palm oil industry, following criticism through the SADP complaint and the World Bank’s private sector Wilmar complaint to the CAO, that funding palm oil development was not a responsible or successful way to promote economic growth in developing countries. The World Bank sent a response letter, refusing to suspend the project. It reasoned that oil palm planting under the project was not scheduled to begin until after the policy violations would be corrected. The response letter also provided target dates by which key improvements would be completed to help bring the project into compliance with bank policy. Accountability Counsel sent a letter to the President of the World Bank requesting that the bank’s funding for the project be suspended until admitted policy violations are corrected. The board approved the Inspection Panel’s recommendation and authorized the panel to conduct a full investigation into the issues raised in the complaint. The Inspection Panel submitted a report and recommendation to the World Bank’s board of executive directors, finding the complaint eligible for review and recommending a full investigation into the matters raised in the complaint. Based on information gathered from its site visit, the Inspection Panel found that the complaint asserted serious violations of the bank’s operational policies. The Inspection Panel underscored the gravity of issues raised in the complaint, including the question of livelihood impacts on smallholders from oil palm production. The Inspection Panel travelled to Papua New Guinea to meet with some of the complainants and other project-affected people, PNG-based NGO CELCOR, government officials, World Bank staff, and representatives of the Oil Palm Industry Corporation. World Bank Management submitted its initial response to the complaint to the World Bank board of directors. The response denied many of the smallholders’ allegations, but admitted to noncompliance with bank policy in three areas: project documents were not translated into the local language; documentation of consultations with affected communities was lacking; and the environmental assessment required prior to project approval lacked information on milling companies’ capacity to treat the increased mill effluent, or liquid waste, that would result from the project. Management indicated specific steps that it would take to improve the project, including translating project documents into the local language and making them publicly available, and commissioning a study on the effects of effluent discharge on local rivers. The World Bank Inspection Panel registered the complaint in its public registry. Three weeks later, on November 25, 2009, President Zoellick responded, agreeing to extend the palm oil lending moratorium to the bank’s public sector investments. On the same day, Accountability Counsel and CELCOR submitted a request (“complaint”) to the World Bank Inspection Panel regarding the Smallholder Agriculture Development Project (SADP). Accountability Counsel, CELCOR, and partners authored a letter to World Bank President Robert Zoellick, commending a private sector moratorium bank on palm oil investment and requesting that the moratorium extend to public sector investments as well. As a result of Accountability Counsel’s work, we achieved both case victories for our clients in Papua New Guinea and policy victories impacting future communities where the World Bank invests in palm oil. At the case level, Accountability Counsel’s role ensured that the voices of smallholder farmers and communities in Oro Province were heard by the World Bank Inspection Panel, management, board of directors, and president. As a result of the successful Inspection Panel complaint process — and due to dogged advocacy — the bank held new consultations on project design with affected communities and redesigned key, flawed aspects of the Smallholder Agriculture Development Project. The impact was that people in Papua New Guinea had a role in designing the project affecting them. At the policy level, our work contributed to a moratorium World Bank Group palm oil lending while the bank reviewed lessons, including from our case, on how to improve the approach in this sector. Our feedback into this new framework was captured in many elements of the final, revised bank policy. Floating fresh fruit bunches across a river in Papua New Guinea because the bridge had washed out.